2012 - Why a BC20? 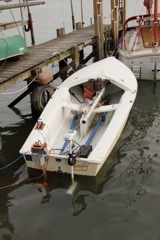 Following discussions on the Swallow Boats Association Forum and out of curiosity, I tried a bollard pull comparison of the Torqedo 1003S and the Minn-Kota RipTide 40. 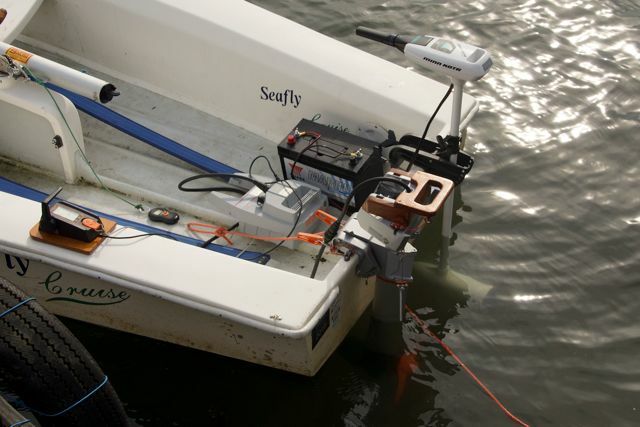 Both motors were mouted on the stern of my Seafly dinghy which was tethered to the jetty using the orange propylene rope and electronic balance (as seen in the photos). I don't know the absolute accuracy of the balance but assume it's good enough for comparison purposes. The Torqeedo looks odd with battery detached and a remote throttle but, apart from the shaft being shortened by 45mm to fit my BC20, is a standard motor with an almost new propeller. The Lithium-ion battery was reading 99% charge. The MInn-Kota was powered by a fully charged, fairly new, 100Ah deep-cycle battery connected directly using it's own cable. It hadn't been used for a couple of years but showed no sign of any problem. Once I managed to get a steady pull, which was not easy, the Torqeedo read 34kg (Practical Boat Owner got 32kg) while the Minn-Kota only managed around 12kg. The Minn Kota claims 40lb (18kg) thrust. Torqeedo suggest that figure would be exaggerated by about 50% - which would be in line with my measurements. In contrast, Torqeedo claim about 31kg for the 1003S , a bit less than I measured. Thus Torqeedo would suggest 2.5 times the power of the Minn-Kota whereas my test gave more like 2.8. I'm not sure these small differences are significant. Having the two mounted together was very interesting. Compared to the Torqeedo the Minn-Kota feels better engineered with strong transom clamps and a sacrificial anode in the propeller hub. I'd forgotten just how quiet it is - silent would not be an exaggeration - whereas the Torqeedo whines. So I was somewhat disappointed that the power ratio was quite so large! However I realised afterwards that I'd done the wrong test. I need to compare the thrust of the two motors when the throttles are set at a practical level - that is one which will allow a reasonable length of operating time. I'll do that on another day! [Note added 13th October:] Well, on the 11th October I tried - but I'm not sure if I succeeded! At around 240W I measured (or rather, estimated) between 10 to 15kg pull from the Torqueedo. Before I could get a really steady reading the rain got into the electronic balance and it stopped working... if the balance recovers I'll try again some time! If these readings were correct then it suggests that the Torqeedo does have more thrust at a practical level of power than the Minn Kota - but I wouldn't like to quantify the difference without more tests. [Note added 23rd October:] See my entry for 22nd October for more tests of the Torqeedo Bollard Pull at different power settings.